This chat was sponsored and co-hosted by @Canon_Solutions. According to @hashtracking 54 contributors generated 820 tweets delivered to 8,090,112 timelines on Twitter for this #PrintChat! Vertical Marketing = services specific to an industry, trade, profession, or other group of customers with specialized needs. Vertical marketing is focused content to a target audience… think of it like keyword search results. Examples of Vertical Markets are: Education, Banking, Healthcare, Real Estate, Automotive, Retail and Finance. The right tools combined with the right applications can open up the doors to new print business opportunities. 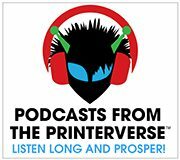 Thanks for co-hosting @Canon_Solutions AND your support of #PrintChat and the #print peeps! Proud to have you as a partner and #PrintChat sponsor!